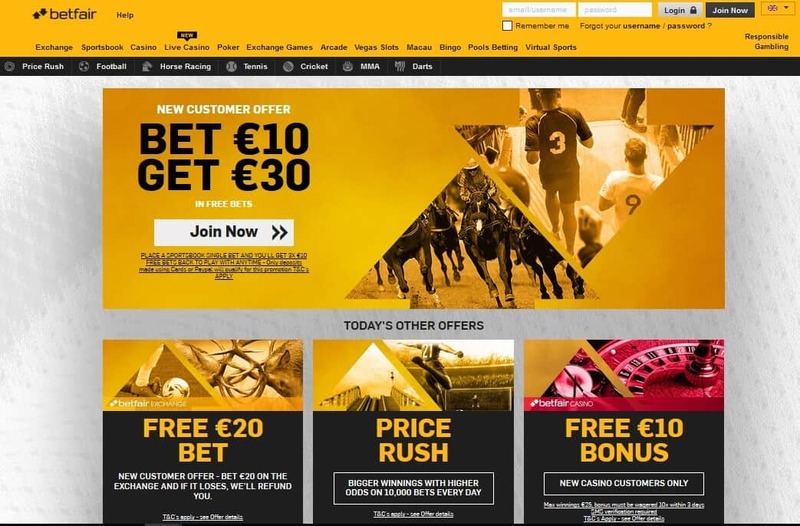 Betfair.com is a very popular sportsbook in Ireland. They offer E-sports, wide range of sport games, live and in-play betting, a mobile bookmakers, and more. They have a €30 free bet sign up offer and there are plenty of promotions too when you register. Read our BettingTop10 review for more information on odds, tips, and more. Big brand name with excellent reputation. Huge choice of odds and markets for all sporting events. Live streaming and in-play betting. Lots of deposit and withdrawal options with fast cash outs. Not the biggest welcome bonus. 5% commission on bets placed through their betting exchange. The Betfair website is quick to load and very easy to navigate. There is no download required to place a bet and everything can be done through your desktop browser once you log into your account. When you enter the sportsbook a menu is shown on the top of the screen. Users can choose from All Sports, Home, In-Play, Cash Out, Price Rush, Promotions, Football, Horse Racing, Tennis, Greyhound Racing, Cricket, and Golf. There is also a quick links menu on the left-hand side of the page showing all the sports and the In-Play menu. The menus are expandable and include Football Specials, Horse Racing, Golf, NFL, NBA, and more. The middle of the page shows the sports highlights and users can click on the tabs to show the sport they want to see. This shows the upcoming matches and the current odds. Just click on the category you want and place your wager. The Betfair mobile app is available for Apple and Android devices. If you own an iPhone or iPad you can download the free app from the App Store. Android users will find the link to download Android app on the Betfair website. All new sign up using the mobile sportsbook get an exclusive bonus which is a free €30 bet. Users can cash out whenever and wherever they want, use the in-play platform across hundreds of markets, and use the price rush feature where they receive boosted odds even after they’ve placed their bets. To claim the mobile bonus new users have to bet €10 to claim €30 back as a free bet. The mobile sports book also gives uses daily promotions including free bets, double odds, and Acca multipliers. The app is excellent and provides Irish punters with access to pre-match odds for hundreds of markets as well as live odds on selected in play markets. You can also access your bet history, deposit and withdraw funds, cash out, and view live scores and live streaming. Betfair offers odds on a wide range of sports in several key markets. This includes popular events such as golf, horse racing, football, tennis, rugby, cricket, MMA, NBA, and NHL. They also offer markets on specials like politics and television series. The odds are often the best you will find too. Football odds include match results and Asian handicaps, and bettors in Ireland will find a huge range of odds on pre-match and in-play as well as regular enhanced odds. It’s not just football, they have the best horse racing coverage too. The in-play section of the sports book is impressive and users will find all the odds, which change as the game progresses. The odds are refreshed every few seconds and there are lots of different markets available. When you select the match, you will be taken to the match page and here all the odds are displayed. Football odds include the overall match odds, both teams to score, first goal, correct score, draw, over/under, over/under first half, half time/full time, and more. There are tabs at the top of the in-play section and these include Popular, All Markets, Quickbet, Score, Team, Player, Goal, and Half Time. The cash out feature is amazing and this makes it possible to win even when things aren’t going well. It is a chance to limit your losses. Live streaming is also very popular and this is free of charge to members, but to watch horse racing live you have to have placed at least €2 worth of bets on the race via the exchange. There are live streams available for all major sporting events as well as live in-play odds and betting options to keep you entertained. Players can enjoy great cash back specials on horse racing and football as well as up to 25% bonuses for winning accumulator bets. There are also bonuses for multiple winnings in hockey, basketball, and other US sports. The software developers used by Betfair include Betgenius, Colossus Bets, Inspired Gaming, and OpenBet. They hold licenses in Malta and United Kingdom and there is no download required to place a wager. The software is safe and secure and uses SSL encryption to ensure that all financial transactions are secure. The software is also guaranteed fair. The OpenBet software used for the sportsbook is the best in the world. It’s fast and able to cope with the busy demands of a sports betting website. The software can offer any type of sporting event and any type of betting market with fixed odds and pari-mutuel betting. The In-Play platform is excellent too and can be used for any event and any market in the world. The Betgenius sportsbook platform is flexible and allows clients to offer VIP treatments and more. It also allows for in-play trading services across more than 25 sports including eSports and horse racing. Colossus Bets is used for the pool betting offered by Betfair. This is available for football pools. The software is used for syndicate betting and adds to the appeal of the overall package offered at Betfair. The Inspired Gaming software is used for the virtual sports section of the website and provides ultra-realistic games that are available for desktop and mobile. Betfair offers the fastest payouts for Ireland and there are plenty of currencies including Euro. They offer plenty of deposit and withdrawal options including debit and credit cards, Skrill, Neteller, PayPal, and bank transfers. Payouts are quick and even bank transfers are processed within 1 working day. E-wallets are the quickest and these are handled within 12 hours but don’t be surprised to find your money in your account a lot sooner. Below you will find a step by step guide to making a deposit at Betfair. Step 2: Click on the “Deposit” button which can be found at the top right hand side of the home page. Step 3: Choose the payment method you want to use. All the payment methods available to you will be displayed on this page. Step 4: Enter the amount you want to deposit and your password. You may be required to enter further details such as your CVV security number, or your credit/debit card number. If you are using one of the e-wallet option such as Neteller, Skill, PayPal, Web Money, or Paysafecard, you will be required to enter relevant information for these accounts too. All the details are given on the Betfair website. Step 5: Confirm your deposit and start placing your bets. The Betfair promotion for new customers is a 100% match bonus up to €100. There is also a free €20 Exchange Bet where if you bet at least €20 on the Exchange and lose, your money will be refunded. The €100 welcome promotion is offered on your first deposit and is a 100% match. New sign-ups must opt in for this in the cashier section. The wagering requirements are 4x bonus and deposit and all single bets must be placed on selections with minimum odds of 3/5 (1.6) or about. In multiple bets odds must be 3/5 or higher. Bets must also be placed on the Betfair sportsbook. The bonus expires after 90 days and in order to make a withdrawal you must complete the wagering requirements. There are more terms and conditions and these can be viewed on the website. The other promotion currently running at Betfair for Irish punters is the Best Odds Guaranteed on Horse Racing. If you back a horse and the industry starting price is higher, you’re bet is paid out at the higher odds. There are terms and conditions which can be found on the website. The other Betfair promos that are listed on the website are for the casino and arcade. These include a free spins bonus for the casino and a Bet €10 get a €10 Bonus in the Betfair Arcade. Both of these offers are for new players only. Customer support at Betfair is one of the best you will find. They offer 24/7 support via a number of options and they also have an extensive FAQs section on their website. All this is available via their website https://en-betfair.custhelp.com/app/contact_us and there are several ways to get the help you need. live chat – only via member’s portal. Twitter – @BetfairCS (8am to 11pm GMT). Live chat is really fast and emails are answered in 2 to 4 hours which again is really fast compared to competing sites. You must be logged in for Live Chat. Betfair has an excellent reputation and offers some excellent promotions. Get a €30 free bet when you register for an account. Their odds are excellent and there are plenty of betting options for Ireland. They also offer regular enhanced odds with a live streaming of major sporting events. New promo codes are available all the time and the terms and conditions are fair. Live in-play betting is excellent and there are odds and options for every Irish bettor.